Dating back to 1790 we are one of the oldest sailmakers still in business. 1790 George Rogers Ratsey establishes Ratsey Sailmakers in Cowes. C1800 George Rogers Ratsey builds sails for HMS Victory. A fore top sail remains in the Naval museum in Portsmouth. 1903 Ratsey and Lapthorn New York build sails for the next Americas Cup defender Reliance, the same year the British loft equips it’s challenger Shamrock 3 with Ratsey and Lapthorn sails. 1917 After 15 successful years in New York, George Ratsey opens the new loft on City Island; 3 floors, each over 150’ long and the largest sail loft in the world. 1930 James Lapthorn develops a new strand of cotton from Sudan, weighing in at 29.03 oz it was the heaviest cloth yet used in sailmaking and despite its exorbitant price was used for Enterprise, the U.S defender of the America’s Cup and for Migrant, at 220’ long the largest schooner in the world. 1937 Ratsey and Lapthorn are again the choice on both sides of the pond, The New York loft building sails for the Cup defender and ‘Super J’ Ranger whilst the UK loft equips Endeavor 2, the British entrant with George Ratsey amongst the crew. 1942 As part of the war effort, R&L equip the U.S forces with custom canvas orders including tank covers plus in conjunction with Luders shipyard, develop a rescue boat for downed airmen that attached and deployed from the undercarriage of a plane. 1958 The New York loft builds 27 sails for the Cup Columbia whilst the UK loft equips Sceptre, the British entrant. Colin Ratsey sails on board the American boat whilst George Ratsey crews for the British. 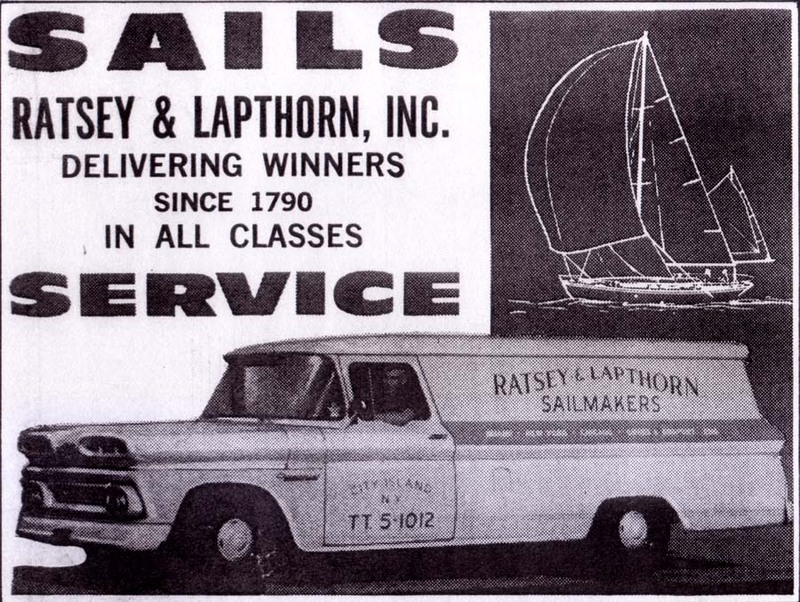 1982 After the demise of the great sailing yachts and the introduction of modern synthetic fabrics, Ratsey and Lapthorn announces the closure of the New York loft. 1982 – present day Sailmaking continues in Cowes under the guidance and stewardship of Andy Cassell.